True story: I still play the Game Boy I got for Christmas back in 1989. (Technically, it was the Game Boy that my brother, sister and I were supposed to share, but they gave up on video games a long time ago.) 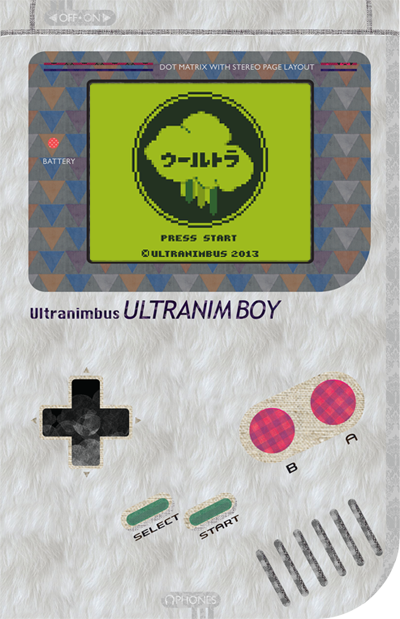 Recently, I wrote a short story about my preferred gaming device for Ultranim Boy, a zine filled with Game Boy stories from the Ultranimbus collective. The zine hasn’t been released it, but you can pre-order it now for only $5. Trust me, you’ll want to see what’s in here. It’s high quality. Check out more photos from the event on Flickr. 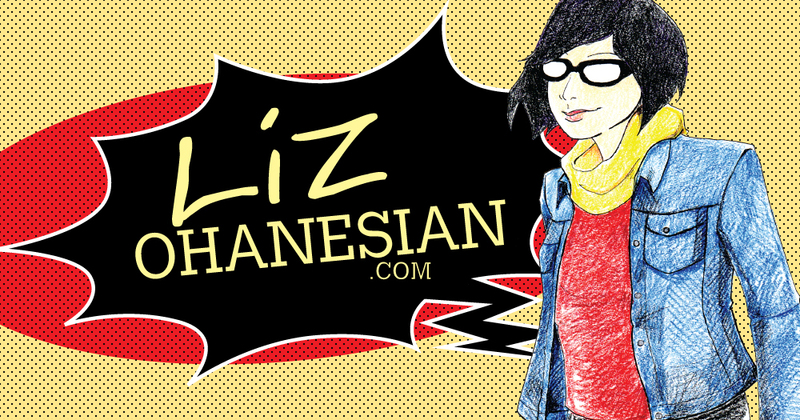 You can also follow me on Twitter, Facebook or Tumblr. Posted on January 25, 2013 by Liz O. In an attempt to be a more productive writer, I’m posting my progress updates here. I only had one story due this week. For me, that’s a terrible week, but I tried to use the downtime to pitch more and to work on Los Animales. That one story was my column for L.A. Weekly. 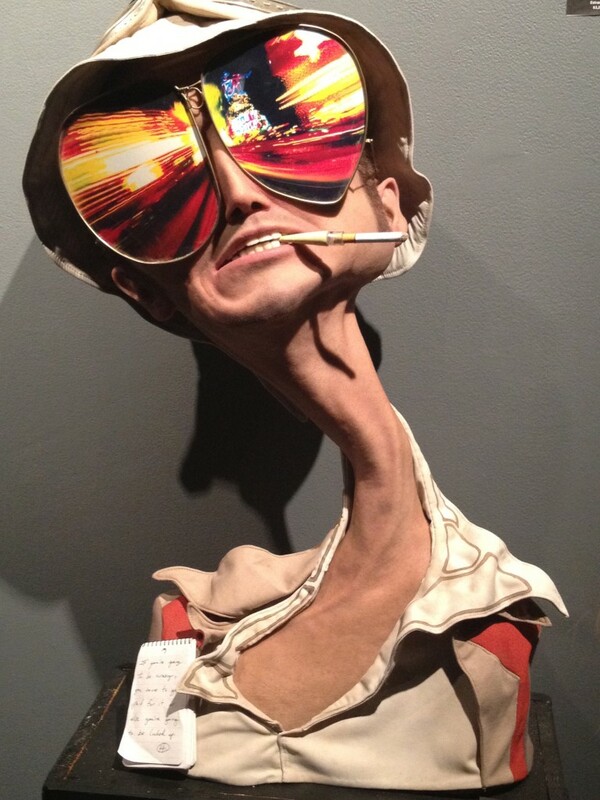 If you haven’t seen it already, check out “Conjoined III: Chet Zar’s Annual Art Show Includes Busts of Abraham Lincoln and Raoul Duke.” Thank you to everyone who shared this piece on Facebook, Twitter, etc. We’re reaching our self-imposed deadline to get Los Animales online, so Jeaux and I have been working intensely on this. Right now, the bulk of the creation work falls on him. He’s inking Chapter 1. I’m writing Chapter 2, which is due in two weeks. We had our weekly meeting, launched a Tumblr page and did a bunch of other prep work. I pitched a few stories this week, but haven’t heard back on anything yet. Despite that, someone did contact me for an assignment, so that’s something. Plus, I got a lead on another thing that could potentially be a new outlet for me. :::fingers crossed::: And then I made headway on a bunch of leads for future columns. All that said, bad week wasn’t so bad. Next week, I have three stories due. That’s more work than I have had since the holidays, but it’s still not quite enough. I’ll keep hustling, though, and maybe next week will end on a busier note. This is my desk. It’s all ready for me to work on another rewrite of the second chapter of Los Animales. I think this is the fourth rewrite I’ve done. Maybe more. I can’t remember. The first chapter went through about three or four rewrites and we’re still editing that as Jeaux works on inking. I’m sure will continue editing it after he’s done. Since we’re doing a comic that revolves around music, I’m basically playing certain bands and albums on repeat as I write. For the first chapter, I worked with The Smiths last, and most amazing, album Strangeways Here We Come as well as Alive 2007, the live album from Daft Punk (one of the only live albums that doesn’t annoy me). For Chapter 2, I’m listening to Pulp, specifically Different Class, The KLF and acid house-era Psychic TV. 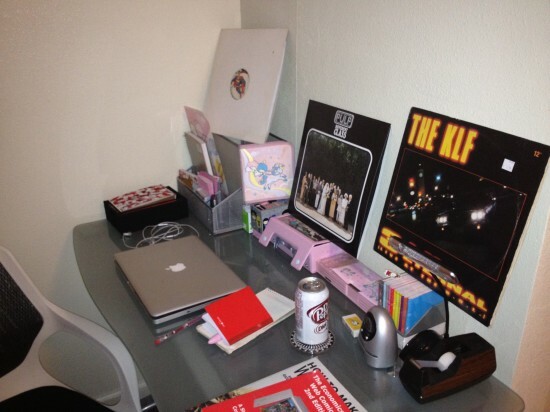 Right now, I have The White Room, by The KLF, playing through the office. 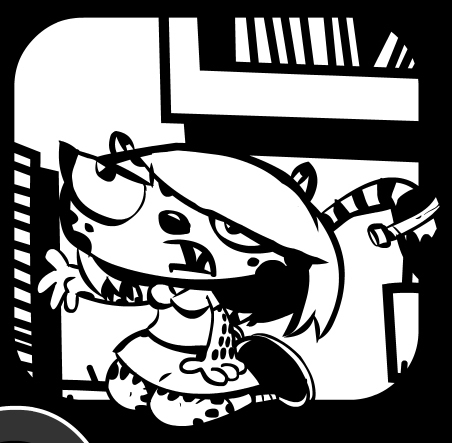 If you’re on Tumblr, you can keep up to date on our last minute efforts to finish Los Animales. Posted on January 24, 2013 by Liz O.
Manda and Dani from Los Animales. Art by Jeaux Janovsky. Here’s a quick sketch of Manda and Dani that Jeaux did this morning over a breakfast meeting at Denny’s in Reseda. This is our second Denny’s meeting in the past six weeks. The first one was in Granada Hills. I’m starting to think we should just hit up every Denny’s in the Valley. Jeaux thinks we come up with our best ideas there. I think he’s right. Fueled by Moons Over My Hammy and coffee. I really like what Jeaux did with Dani. It’s kind of like he read my mind. 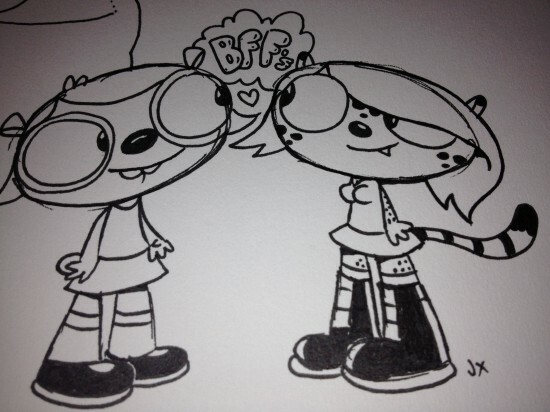 Dani is intended to be Manda’s much cuter friend, the one guys hit on before she mouths off and they move on to Manda. She’s kind of an amalgamation of all of my female friends, every one of whom got hit on before me at the clubs. Dani’s really energetic and good-natured, though she can be pretty mouthy and has a knack for making awkward situations worse. Manda is surly and bossy. She also has perfectionist tendencies. She bites her lip and rolls her eyes. She may or may not be based on the person who wrote this blog post. 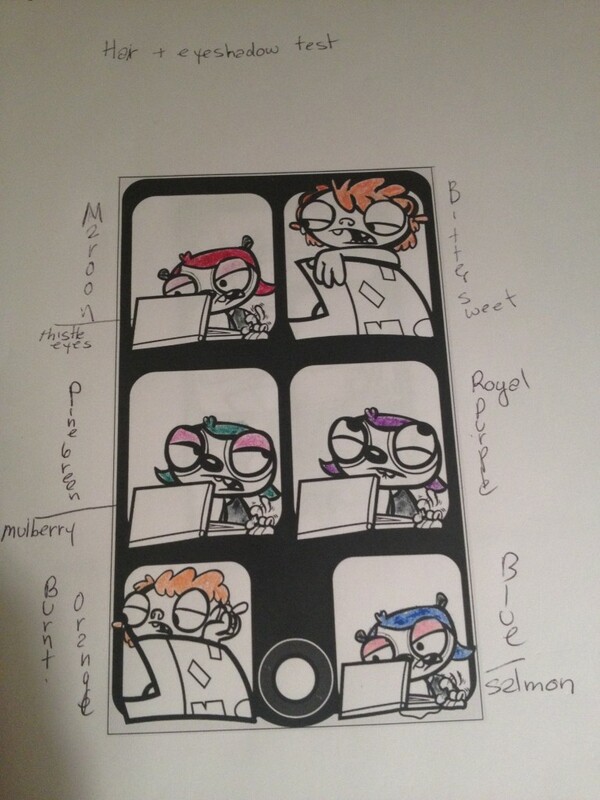 We’re trying to fine tune all of the characters’ quirks right now. Thinking about how they will move. Thinking about how they will speak too, even though we won’t be laying down any voice tracks at this point. I was trying to explain to Jeaux how we should pronounce Los Animales. Short a in Animales, pretend the e at the end is an i.
I’ve been fascinated with accents and cadence for as long as I can remember. I’m trying to teach myself how to best convey the intricacies of speech in word bubbles without messing with spelling. I can hear the characters when I write and I want you to hear the same thing. It’s a tricky thing to do, but it’s getting easier to do as I get further into rewriting the second chapter. We’ll see how it goes. Posted on January 23, 2013 by Liz O.
It’s a little after 2 p.m. in Los Angeles. I’m at my desk, inside the office in my apartment and listening to Suede. This is the last task on my to-do list for today. “Write a blog post.” I’m trying to force myself to write something everyday and put it online, even if it’s in a spot where only a couple will read it. I read a great post on the Freelancer’s Union blog today. It’s called “Five Tips for Preventing Procrastination.” I needed to read this. I have procrastination issues. This probably isn’t the sort of thing I should admit on a website that I intend to use to try and convince people to hire me. I procrastinate. If I were the only person on the planet to do this, there wouldn’t be so many “stop procrastinating” articles out in the world. I also recognize that I have one of the issues mentioned in the blog post, I’ll put off projects because I don’t think I’ll be able to complete them perfectly on the first shot. I’m trying to change that. This morning, I made a to-do list. I completed the first two tasks before 8 a.m., the third before 10 a.m. and the fourth before noon. I grabbed lunch, watched some South Park, and finished the fifth task by 1 p.m. Then I ran some errands and came back to write this. Considering that one of those tasks was a pretty beefy pitch letter and the other was a transcription, I think that’s efficient work. I tend to work at my best when I have a lot of work. There’s no procrastinating when you have four stories due on one day. Right now, though, work is slow, as is often the case for me at this time of year. With less work, comes more of an urge to put off work. To keep myself in check, I work with both old and new school methods. I write down an actual pen-and-paper list and check off items as I finish them. I also tweet out my progress while I finish stuff. That’s mostly for myself, I don’t really care if people find it uninteresting. It’s my way of forcing myself to actually do something. In this case, it worked really well. I finished early, far earlier than expected. That gives me more time to compile items for my idea file and work on a revision of Chapter 2 of Los Animales. This is progress. Posted on January 21, 2013 by Liz O. New York-based artist Michael Mapes creates intensely detailed specimen boxes, the likes of which you probably have never seen. German brothers Low Bros talk about the evolution of their art, both on the streets and in the galleries. Based in Greece and the U.K., Vasilis Avramidis paints exquisite, and slightly untended, fictional landscapes. 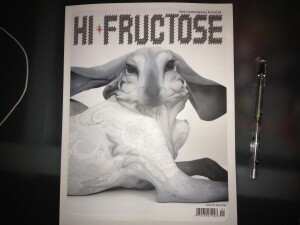 You can also order Hi-Fructose online through the magazine’s website. For more updates, follow me on Twitter and Facebook. In this week’s installment of my L.A. Weekly column, Cult Stars, I headed down to Santa Monica to check out Conjoined III. This is an annual group show curated by Chet Zar that includes both gallery-centric artists as well as artists who work primarily in film and television. This year’s show hosted a spectacular array of work. 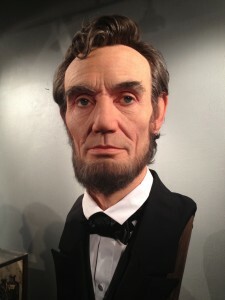 I was taken by the busts of Abraham Lincoln and Raoul Duke, which are the focus of the blog post. The Raoul Duke piece was created by Kevin Kirkpatrick, the same artist who is responsible for Beavis and Butthead in Real Life. For more updates, find me on Twitter and Facebook.